However, the good news is – there is something you can do to prevent nocturnal (night) grinding and the damage it causes and those of us at Ian Barwick, DMD are here to help you. If grinding is a problem for you or a loved one, Ian Barwick, DMD has the solution. 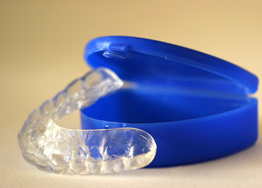 Please call our office for an appointment to be evaluated and fitted for a night guard. Don’t let teeth grinding become a bigger pain than it already is!